Order a Support our Troops specialty licence plate. The Support our Troops licence plate honours current and former members of the Canadian Armed Forces. The design feature artwork in honour of the first four Alberta-based Canadian soldiers whose lives were lost in Afghanistan in April 2002. 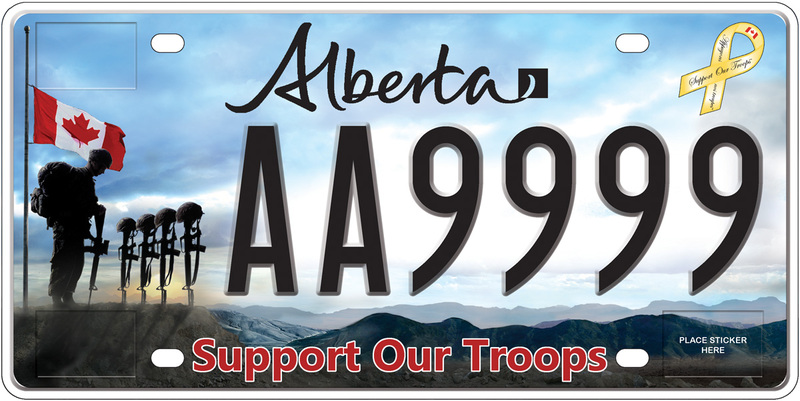 Order a Support our Troops licence plate at any Alberta registry agent. One-time fee of $75 plus a $9 registry agent service charge and GST. Standard vehicle registration fees apply. Support our Troops plates are only available for passenger vehicles used for personal transportation. Most of the money raised from the plates will go towards the Support our Troops program managed by Canadian Forces Morale and Welfare Services to assist military members and their families. The Support our Troops plate does not replace the veterans plate, which are only issued to eligible members of the military. Unlike the veterans plate, anyone can order the Support our Troops plate. You cannot exchange a veterans plate for a Support our Troops plate.